Today Al VK1RX and I have teamed up to activate three SOTA peaks, Al’s plans include operations on HF, 7 and 14 MHz while my aim is to activate and qualify each peak on 144 and 432 MHz. Today’s SOTA activation will be my 13th attempt at qualifying a SOTA peak on 70cm 432 or 439 MHz, 13 will be my lucky number! So far my tally for 2016 is 10 out of 12 peaks with a strike rate of 88%. 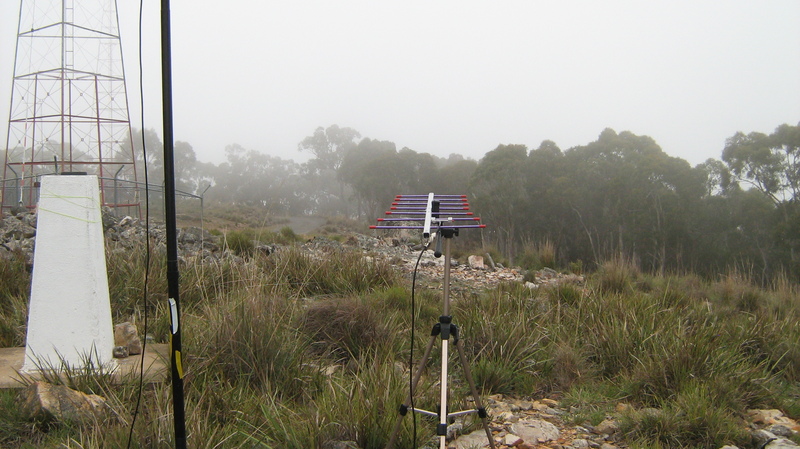 Summits not qualified on 70 cm are Blackfellows Hill and of all places Mt Stromlo only 6 km from my home QTH in Canberra. Weather on the summit: 15 degrees C, light winds, foggy in the cloud 🙂 Water consumption one litre. For directions to this summit see my post SOTA – Mt Mundoonen 13 December 2014. The ascent to the summit is 110 metres over 1.2 km (0.8 miles) taking 20 minutes. On this occasion Al VK1RX and I had a heap of antenna gear so we elected to drive to the top of the asphalt road and parked the car next to the LF compound. 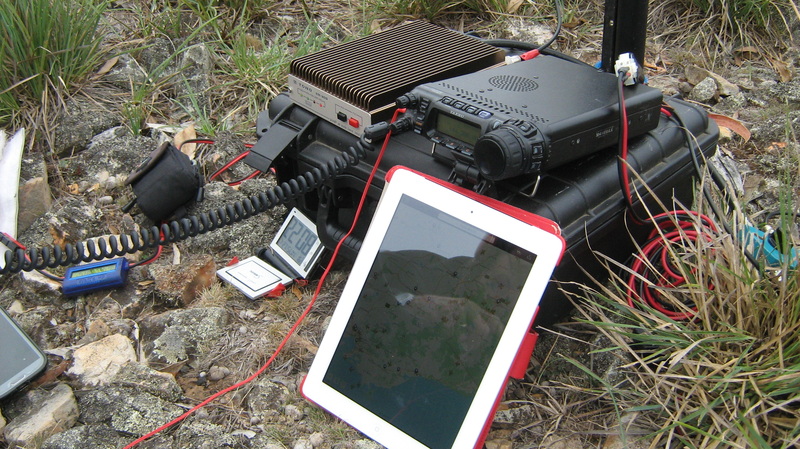 In the picture below and on the ground with nature, VK1AD SOTA station consisting of Yaesu FT-857D, 2m 90 watt amplifier, powered by 4S 8.4 Ah LifePO4 and 4S 4.2 Ah LifePO4 batteries, antenna switch to select the 2m or 70cm yagi, iPad running FlightRadar24, 2m 4el yagi and a 70cm 7el yagi, plus other bits and pieces. 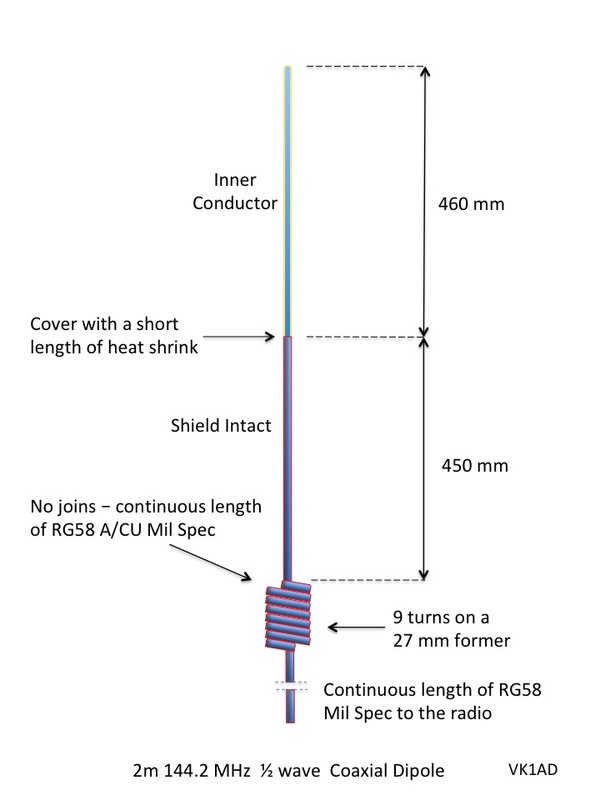 The FT-857 has a single rear N connection for 2m and 70cm hence the need to switch antennas on changing bands. While operating on 2m and 70cm, Al and I discussed the pros and cons of my antenna switch (rated to 600 MHz) versus a 2m/70cm duplexer. Hmm I can see a new piece of kit in the mail, even before I leave the summit! 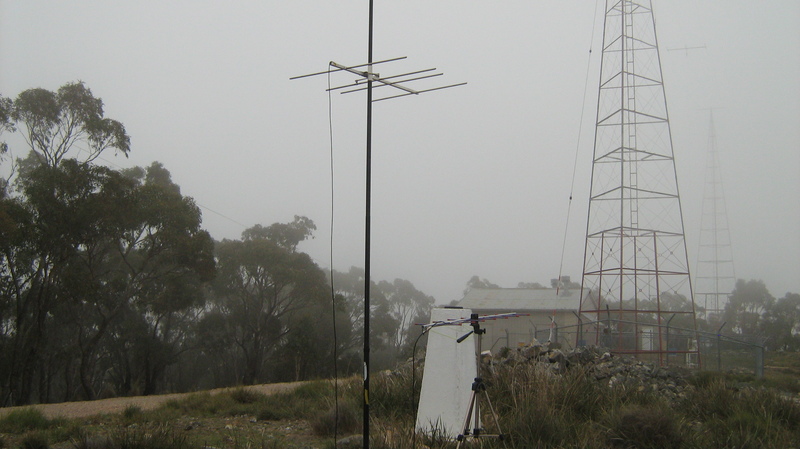 My aim for 2m is to work Bernard VK3AV, a regular HF SOTA chaser on the north-east fringe of Melbourne and now a new entrant to VHF Dx. During the week Bernard and I exchanged emails where we discussed the likelihood of a SOTA contact on 144 MHz aided by Aircraft Enhancement (AE). Based on my limited experience with AE, which dates back to 2013 where Allen VK3HRA and I made the first VK VHF Dx 2m SOTA S2S contact over 490 km, leading up to this activation I was confident Bernard and I would make a valid signal report exchange. Today I am using the same homebrew 2m 4el yagi as I did in March 2013. On 2m the VHF Dx contacts were (IMHO) impressive! The furthest contact was with Ian VK3AXH at 560 km (347 miles) followed by Arie VK3AMZ at 528 km (328 miles). I am very pleased to report Bernard and I made two SOTA contacts on 144.160 MHz USB the first at 21:29 UTC and just for fun the second at 21:52 UTC, just to prove the first attempt wasn’t a fluke. 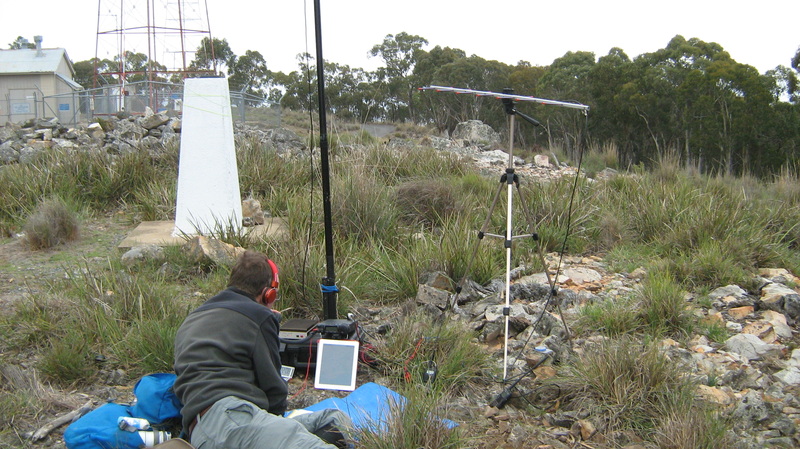 The exchange of signal reports was achieved when commercial aircraft were flying over Lake Hume, 227 km south-west of Mt Mundoonen and yes you guessed it, 227 km north-east of Bernard’s QTH exactly mid way between our two stations. 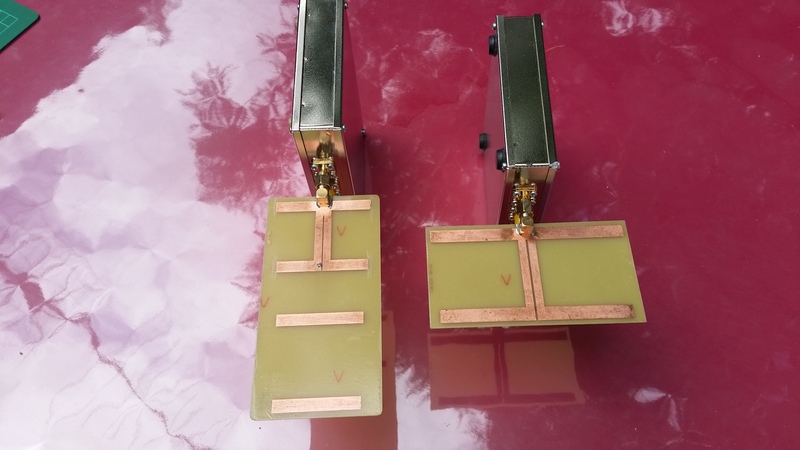 Each of the two VHF 2m AE contacts lasted about 3 minutes. 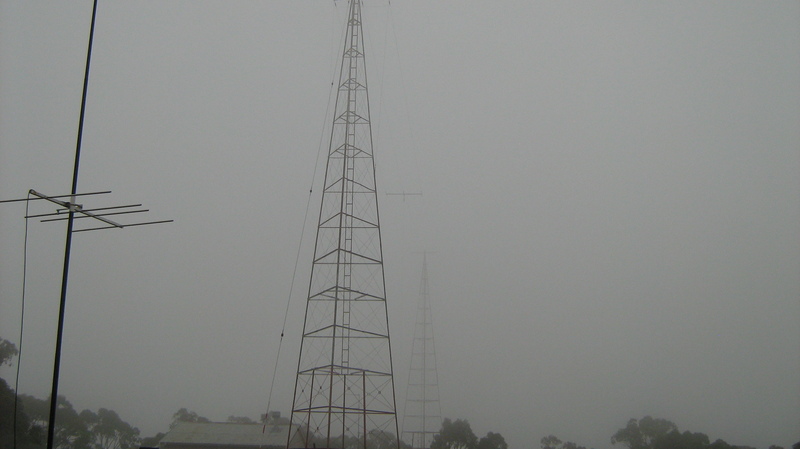 I should mention I did swing the yagi around to the north-east and I posted a number of alerts for CQ Sydney and CQ North-east. Unfortunately there were no takers in that direction. 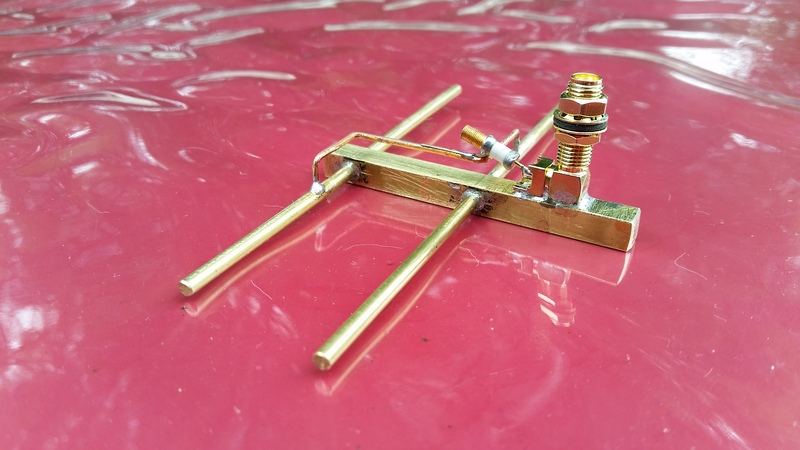 After preparing this post, I hope some of the current crop of VK SOTA activators will take encouragement from this post and try VHF Dxing as a different experience to the reliability of 40m. There are a few sacrifices to be made, like getting out of bed at 5:00 am, being ready on the summit by 8 am and being patient while you wait for the alignment of aircraft and the elusive weak VHF signal to pop out of the noise. What’s exciting about VHF Dx is on one hand the unpredictability of who might be calling CQ and on the other hand the ability to predict a short QSO based on the movement of commercial aircraft. The bigger the aircraft the bigger the lift in signal strength. In some cases a reliable VHF point to point circuit can develop without the aid of aircraft enhancement. While writing this post 11 April 2016, I am pleased to report I have set myself a new PB for a 70cm contact from Bobbara Mountain VK2/ST-044. More on that activation soon. Great work Andrew. Very interested in the AE and how you have attached the antenna to the squid pole. I will prepare a post and send a couple of pics to you. I mounted an antenna U bolt clamp to the yagi boom and inserted a short length of plastic conduit in the U bolt. 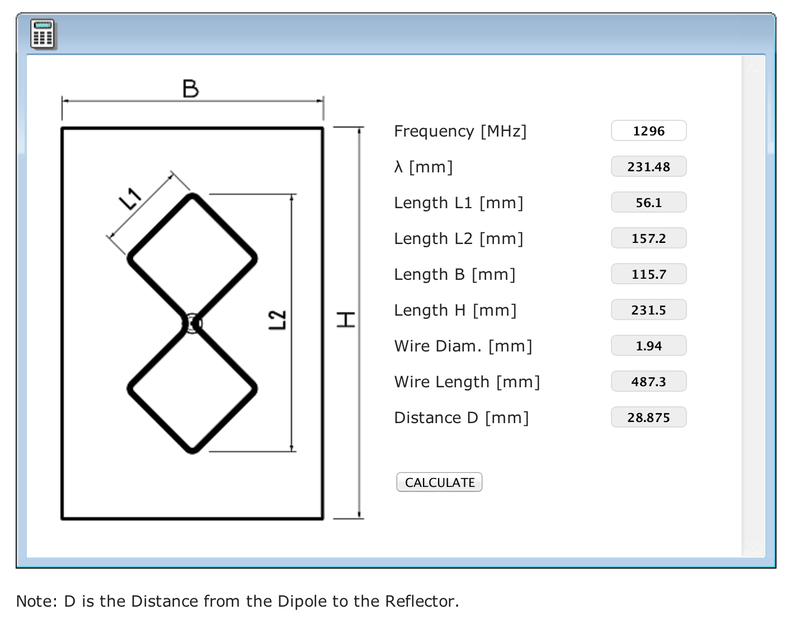 I selected a tube diameter where the tube rests on top of the 3rd or 4th section of the telescopic pole. 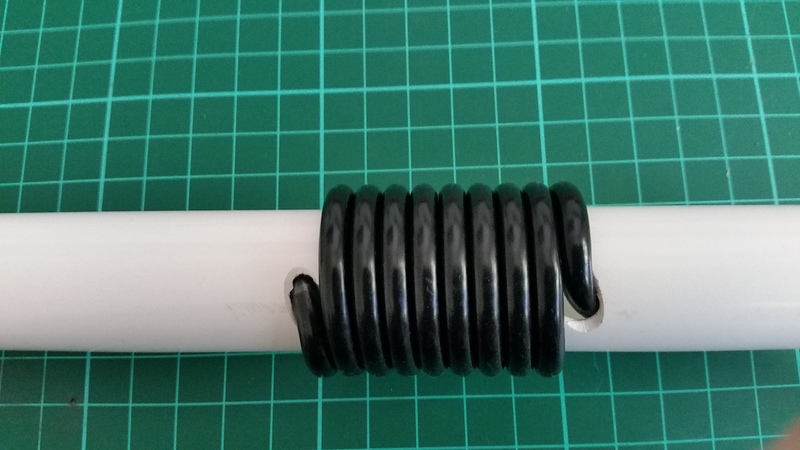 The tube inside diameter has sufficient clearance to allow the yagi to rotate freely on the pole. I should tie a length of 3 mm hootchie cord to the end of the boom to enable easy rotation by hand. At Mundoonen I tugged on the coax (light pressure) to rotate when required.